Can anyone tell me the diameter that a piece of rod should be turned down to for cutting small threads 0.3mm to 0.9mm? 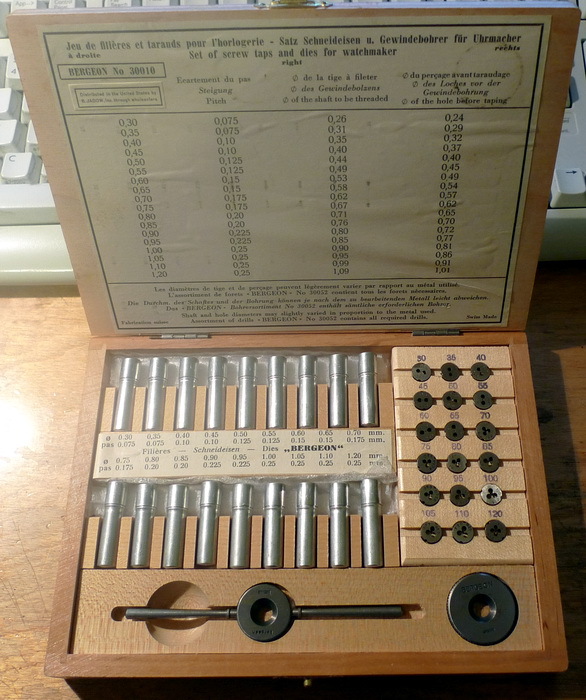 I had a photograph I had taken of some notes inside a Bergeon tap die set which had them but I lost it on my old PC. If you have to cut a thread on a diameter of 0,9mm you have to make that part a little bit smaller in diameter. For example 0.87mm. If you are talking about a thread in a hole you have to make the hole 0,8 x the diameter of the thread. This sounds counter intuitive but it was explained to me that at these small diameters, the die forms as well as cutting so the thread will end up at just under 0.9mm in the end. I wish I could find the table that is in the Bergeon set. I found this site. I think it may have the info you are looking for. I bookmarked it for myself. That's the one thank you for your help. If you like to make thread on a stem (0,9mm) you must make the thickness of the stem around 0,85mm. NO less! For the cutting process of the thread you need special oil (no normal oil!!) that makes the cutting process so smooth! !